One of the things that preconstructed decks are great for is to serve as the foundation for doing a little deckbuilding of your own. When the deck has a very intriguing theme and a good core of cards, it becomes a lot of fun nipping here, tucking there until you have the deck you’re excited to play. Our occasional feature Whsipers of the Muse is a series both by and for the deckbuilders in all of us. Here we take a reader-submitted deck idea and lend the wisdom of the community with suggestions, thoughts, and ideas for making it an even better set of 60 cards. When we say we, of course, we’re speaking about everyone- us here at the Lament and everyone reading as well! I’m kinda new to Magic and only play only with my friends, so a tourney deck is not necessary, even though I want to keep this deck Standard Format legal. I really like vampires, so I bought the Carnival of Blood intro pack and changed it a bit to have more removal, though I think I let it’s mana curve go a bit high. We’ll start with a look at the stock deck, so you know what raw material Jadson is working with, then we’ll turn to his list and some more of his thoughts. Now here’s what Jadson’s come up with so far. Well, I’d like to keep it Black/Red, with focus on aggro and removal. My main concern with this deck is that, since most of it’s creatures are 3-mana or higher, I’m having a hard time with fast decks, specially green/white, since it can boost it’s small creatures to chunk considerable ammounts of my life. Depending on what I draw I can have a certain level of control over the field, with removal/damage spells, but when that doesn’t happen there’s nothing much I can do. I’d really appreciate some help, specially in how to improve it against fast decks while being able to do some nice things on mid-game. So what do you think? 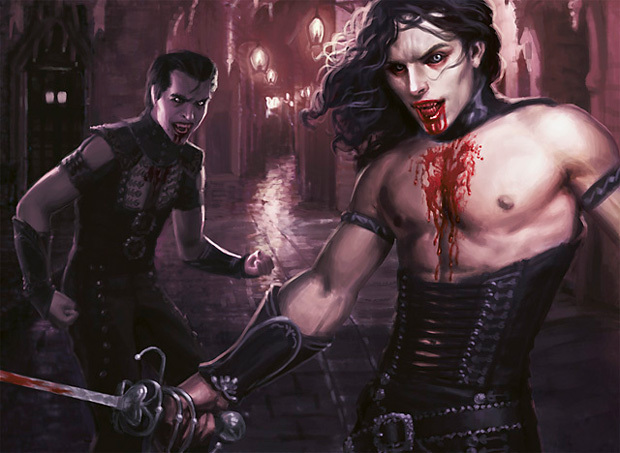 Any ideas that will help Jasdson overcome his Human-infested meta, and lead his Vampire hordes to victory? i think it would be better if you change those Screeching Bat / Stalking Vampire for Vampire Interloper to give more speed to the deck, take a swamp and add another Rakish Heir, and i would take the diabolic tutor and add another Curse of Stalked Prey, the deck seems very solid with a lot of cards that do similar effects, which is not bad (at least in this case), i like to try it some time. I’d cut down the Vampiric Fury to 3. Cut 3 Tribute to Hunger (not that great against humans). Add 4 Shock. just a sugestion in a general form these are so simple to find you wont have to even look around and likely won’t cost you more then a dollar or 2 if you don’t have them already. Markov Patrician & Child of Night are good friends to have when the clock seems quick against fast decks and if they make contact with stalked prey OR Rakish Heir can become very painful, remember im talking kichen table magic, where you dont spend $40 to beat your friends with 4 stormkirk nobles. as for removal (!) spot removal is better then sac effects, volt charge is great and victum of night is fine but i would drop the tributs for some combanation of “doom blade” and “go for the throut” your friends decks will give you an idea what to play more artifacts or black creatures. +1 on Child of Night as it gives you back some speed and has some powerful momentum if you clear the path. Victim of Night is good, but if your group is playing lots of Innistrad, you’re probably already up against a Werewolf/Zombie/Vampire tribal thus nullifying the value. Doomblade personally ‘cuz you can wipe out red vamps, green wolves and humans of course along with whatever rogue creatures hit the table. Shocks are solid in this deck, you may even want gutshot/geistflame if G/W is making a huge splash at your kitchen table. If you have the steam, you might re-gas by adding in some Desperate Ravings/Altar Repas along with the Tutors to really churn through your deck. I know the Marauders are the chase rares, but I’d prefer the beef Sengir Vampires bring to the table, along with the fact that I’m old school. I agree with Jux minus the part about desperate ravings but thats a personal choice and could potentialy win you games so dont be afriad too try it. shocks might be better then doomblade or GFTT and giest flame are great against X/1 guys. I hope adding +1 Hakish Heir and +1 Stalked Prey makes my Volt Charge more efficient on their proliferation effects. About Sengir Vampire, it’s great, but I like how the Marauders can generate +1/+1 counters faster and without the need to kill creatures. Yep, I like It, just enough lifelink to stem the early bleeding, strong enough and ample removal, and less “dead” cards give it a try! You lack a turn one play, so if you can afford it, the best thing to do would be get some Stromkirk Noble. I don’t really play Standard, but seems like it would be great with all those Humans running around. They are also not too expensive, 25 US bucks for a playset. I would probaly get rid of the last Screeching Bat, the pair of Markov Patrician, and the Fireball. If you can’t get the Nobles, I recommend Vampire Interloper. It is a cheap flyer to start adding +1/+1 counters on with Rakish Heir and Curse of Stalked Prey. I would also add one last Rakish Heir. Have fun! Brad, “less” dead cards you said… what “dead” cards are you talking about and what do you suggest doing about them? If I can get rid of everything that’s dead, I’ll sure do it xD. About Sromkirk Noble and Bloodline Keeper, they are great but I can’t afford to get them for now (probably will get them later, but not that soon). Well, the Sengir is not really that awesome of a card either, but 4/4 flyer for 5 in any color is no joke. I figured you’d want something in your 5-slot that stuck with your theme, so recc’ed the Sengir. In truth, if you just wanted sheer power, you can build a standard RDW out of commons/uncommons capable of turn 4 goldfish kills. The biggest downside is no tribal and no theme. The Marauders have the potential to be very fast, but at a timed 5 drop, your opponent likely has a defender making the removal suite that much more important. The sengir while more obvious, is a more consistent source of evasion damage outside of bolt range but still within dismember range. Also as mentioned before, due to cross-color tribalism can’t be d.bladed easily. Brad prolly means if you have an opening hand of 2 copies of vamp fury without the ability to put out creatures quickly enough for the vamp furies to effectively become a force multiplier. In which case, the capability to enhance damage isn’t as great as if you had a means to remove something off the board instead and make those +2/+0 count. I may remove the last Screeching Bat for a Sengir then, didn’t think about the d.blades not targeting him XD. I sincerely thank you all for helping me out and sharing your ideas, it was undoubtfully of most help. I’ll change it I’ll be sure to make you proud xD. I have a suggestion – perhaps you could add some Go for the Throats. I believe it’s quite good removal (unless you happen to be playing against artifacts. Then that could be a problem.) I also think that the flavour of the card is still ‘Vampires”, so.. if you could, perhaps consider it. lol yes by dead cards i talking about “fury” mainly and “curse of stalked” less so not that fack they are undead or anything. I like his deck remake “sengir” is a fine card, a big evasive beater, this deck would like 1 drops but they are expensive and i totally understand his reasoning. my thoughts on interlopers! I like them and id love them if you had 4 rakish hiers but without that 3 drop its tough to race since they can’t chump block so if you have 5 life and an interloper and they have a 5/5 youve lost a child of night can chump and you can then still take a hit it buys you 3 turns and 3 draw phases in situations like that. So, 4 interpolers? What should I drop to add the 4 in? What do you think about dropping one falkenrath noble for a last Rakish Heir? yes, falkenrath noble is a value engine, however, Rakish Hier is a damage/card advantage engine. your building a deck about making stronger creatures making positive trades and crushing attrition unless your friends are wiping the fields DOJ/wrath effects reconsider. Nah, none of my KTC uses mass destruction spells like those. Are you sticking to a particular budget? 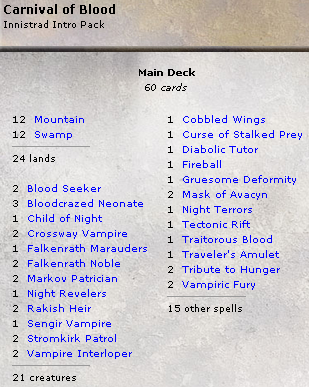 I have a pretty solid vamp deck that is a blast to play, but there are a lot of rares. Rakish Heir is an all-star, seems like 4x. Vampire Interlopers are great too. Bloodlord of Vaasgoth is another great card, and you can get them for 4-5, and even a couple makes this deck hard to beat. Volt charges are good too, as are Tezzeret’s Gambit. Stromkirk Noble is another card that will help with fast decks. Bloodcleave Cliffs and Dragonskull Summit are cheap at the moment too. I do not care for Screeching Bat or Falkenrath Nobles, I would go Interloper over Nobles, and push the Rakish Heir/Stromkirk over the bats. Bump in the night is also a great little card to give you some reach. I’ve been thiking (and also got a few bucks to spare xD), any non-standard cards that would do good for this red/black vamp deck? I still want to keep with the +1/+1 theme. Heres for a belated bump on the thread. I suppose it’s obvious but stromkirk captains is execellent. Dismembers ought to be cheap now that they’re out of standard (I bought mine at a dollar apiece when they had about 3 months left). Non standard lightning bolt will always be better than shock. Vampire lacerators are execellent for a one drop even if they have a bit of a life drain. Personally going into non standard gives a lot of options and zendikar is a great place to start. Falkenrath exterminator I’ve been pretty pleased with in testing and after a few hits it can completely dominate a board. Generally as a last thing I like to avoid combat tricks like vampiric fury because they are as brad said situational and lead to dead draws and when they’re good they tend to be win more and generally don’t do much more than any other non land card.